Müchen Namkhé Naljor was born as the son of Lama Dorjé Sönam, a great scholar of both the old and new teachings. His mother was a yogini who was well known for her practice of the Great Compassionate One, Avalokiteshvara. Already early in life, it became apparent that he was not an ordinary person but possessed great faith and compassion, as well as a certain clairvoyance. He studied diligently and made vast aspirations. From Lama Müchen Gyaltsen Palsang he learned the entire teachings and practices of the Awareness Dakini Niguma, and produced the experience of blissful heat after only a month of practice. 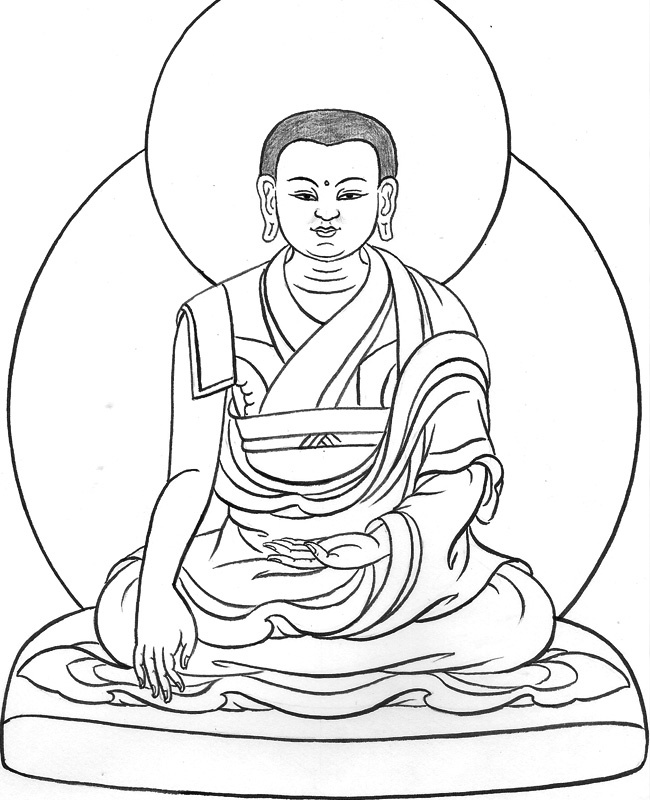 From Khedrub Dorjé Shönu he learned whatever other teachings of the Buddha he could get. At the age of twenty, he took full ordination from Khedrub. Apart from the periods spent studying, Namkhé Naljor spent all his time in the solitude of the mountains, practicing single-pointedly. He achieved the realization of Mahamudra and was protected by many deities. The dharma protectors were always at his service and did his bidding. He also earned the nickname “the Mahasiddha who flies about like a bird” (grub thob bya ‘phur ba) on account of his supernatural abilities. Many illustrious masters of his time were his students, such as Thangtong Gyalpo, Rongtön Sheja Künrig, Jé Tsongkhapa and Khedrub Jé Geleg Palsang. Müchen Namkhé Naljor passed away at the age of ninety-three, amidst rainbows, pleasant scents and rains of flowers. Those of pure faith and vision saw him go to Uddiyana and the Blissful Pure Land of Buddha Amithaba. He left a great many relics for the inspiration of later generations of disciples. Adapted from: bla ma rnam bzhi’i rnam thar bsdus pa le tshan bzhi, shangs chos vol. 1, p. 657-698 (translation from Tibetan by Lama Shérab Drimé).